Tree branches in my neighborhood are literally drooping to the ground with persimmons. This year, my neighbor, Jori, shared not only her persimmons, but also her Most Valuable Paleo-inspired recipe for Persimmon Crisp. 2. In a large bowl, combine persimmons, lemon, cinnamon, nutmeg, and cardamom to coat all ingredients. Fan out the halved slices in an 11 inch round, or 9 x 13 inch, baking dish. 3. For the topping, combine the flour with the sugar and salt in a bowl. 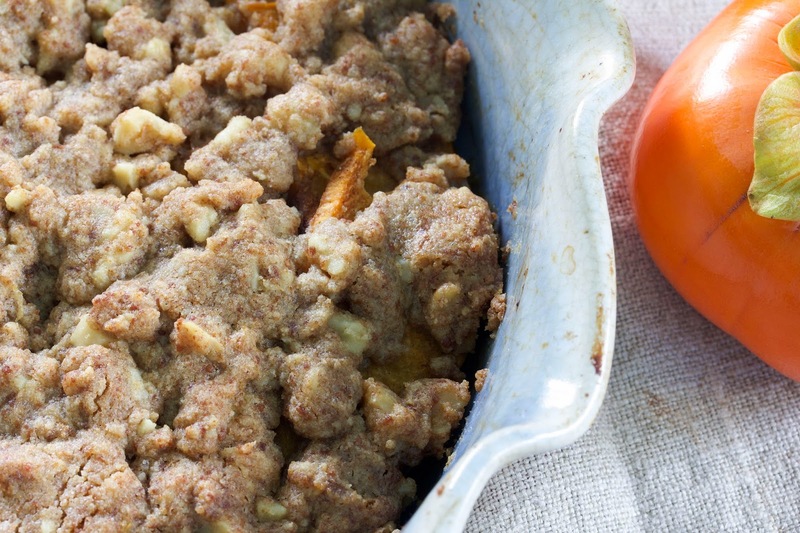 Cut in the butter with a pastry cutter or two knives, add the walnuts, and mix until the dough forms. Pat out the dough over the top of the persimmons. 4. Bake for 30-35 minutes until the crust turns lightly brown and the fruit is softened.